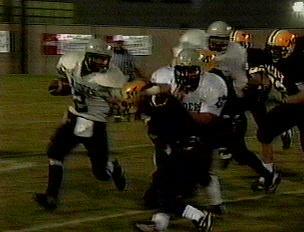 KYJON's Middlesboro High School Football 1998 Champions Page!! Middlesboro High School, 1998 Class A Football State Champions!! 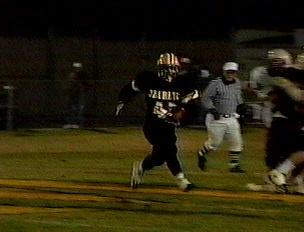 David Kelley running for the touchdown! 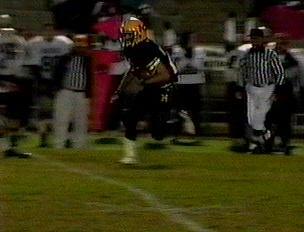 Welcome to KYJON's new page about the 1998 Class A State Champion in high school football. As you should know by now I live here in Middlesboro and I feel that it is my pleasure to make a page about this years season. The Yellow Jackets had a great season, one that I think will go down in Middlesboro sports history. The Jackets had a record of 14-1 this year with their only loss coming to their archrival the Bell County Bobcats. They lost that game by the score of 21-18. But learning from that loss and having some key injuries in that game the Jackets came back to win 11 strait games and capture the Class A Football crown by beating the 5 time Class AA Champs and the 1 time Class A Champs the Mayfield Cardinals by the score of 27-6 on the carpet at Cardinal Stadium in Louisville, Kentucky. 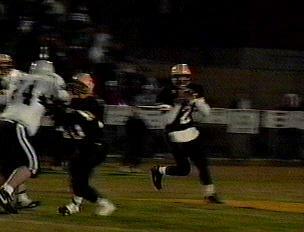 Quarterback Jeremy Skidmore looking to pass. On my page that I am creating for you I will give you the complete rundown of the Jackets schedule on their long journey to the carpet in Louisville. So scroll on down sit back and relax and read about this tremendous season. Oh and by the way sorry to disappoint you there is no team pic of this years championship team available to the internet at this time. On the next page there is a link that I will provide you that will take you to the Middlesboro football homepage that will show you lastyears Class A State Semifinalist football team. I have added some pics to the first page, sorry they are not of the greatest quality, I got them from some taped highlights of the South Floyd game. I guess they will do. Thank you and enjoy. Scott Powell looking for running room! The Jackets swarm to the ball. This guy went down real quick! Kyjon's Middlesboro Football Champions page 2: Click here for the rundown of the season with scores and stats from the games. You have visited the champs times.